In the context of the current debate over Article 9 of Japan’s Constitution, the “Artist File 2015” show of up-and-coming contemporary artists at The National Art Center, Tokyo, is tantamount to a declaration of peace. The remit of this annual event is to showcase “some of the freshest and most substantial work today,” and 2015 being the 50th anniversary of postwar diplomatic relations between Japan and South Korea, this year’s show features artists from the two countries. With a selection of around 250 individual pieces from 12 different artists, “Artist File” is not so much a group exhibition than an attempt to be a collation of solo shows. The selection process, as described by members of the Japanese curatorial staff, involved choosing the person, not necessarily the works, and consequently each section is primarily the exposition of an individual artist, though there was some control over the balance of different media. Viewers wanting to reaffirm nationalistic narratives of art will get little succor from this exhibition. 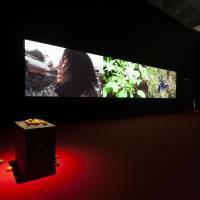 Though there are works that examine regions of significance to the artist, the emphasis is more on the interconnection and hybridity of the global contemporary art scene rather than ways to distinguish Korean and Japanese sensibilities. To some degree this is compounded by the deliberate omission of explanatory text by the curators, something that will be welcome for some visitors but perhaps dismay others. 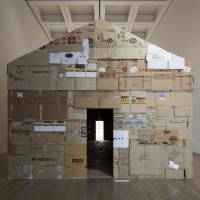 The few biographical details that do appear — name, age and education — are nevertheless revealing, in that many of the artists have studied or live in Britain, the U.S. or Germany. A lot can be read into this, but suffice it to say that these regions have as much, if not more impact on the ambience of the exhibition as Japanese or Korean culture. This is by no means a criticism; rather it could be taken as another indication that artistic merit is being valued over socio-political boundaries. Shizuka Yokomizo, for example, went from studying philosophy at Chuo University to the louche atmosphere of London’s Chelsea College of Arts, and then the notoriously serious Goldsmiths University of London. Her work is divided into two spaces in “Artists File,” one has video and photography of Britons in the guise of acted personas, talking about supposed encounters with ghosts, while a second space is a beautiful exploration of what a photograph can be when considered as a component of an installation. Seulki Ki went to the relatively genteel Slade School of Fine Art in London, after studying photography in South Korea, and shows subtle, elliptical imagery of urban and forest environments that also hint of ghostly presences. Shimon Minamikawa’s enigmatic and minimalist work using boards painted in block color, superficially naive, kitschy sketches and ephemera reflect the kind of blowhard cool I suspect is necessary for survival in Berlin and New York. Three artists who have elected to center their exhibits around a main piece, and which, coincidentally, benefit from subdued and moody lighting design of the gallery, are Junguk Yang, Wonho Lee, and Heungsoon Im. Yang’s is a complex kinetic sculpture made from everyday materials that is essentially a machine without practical purpose. As its parts gyrate and shift, spotlights create eerie moving shadows on the walls. It’s monumental and visually impressive, but while it may be a crowd-pleaser, it does not appear to be saying anything particularly taxing from a social point of view. 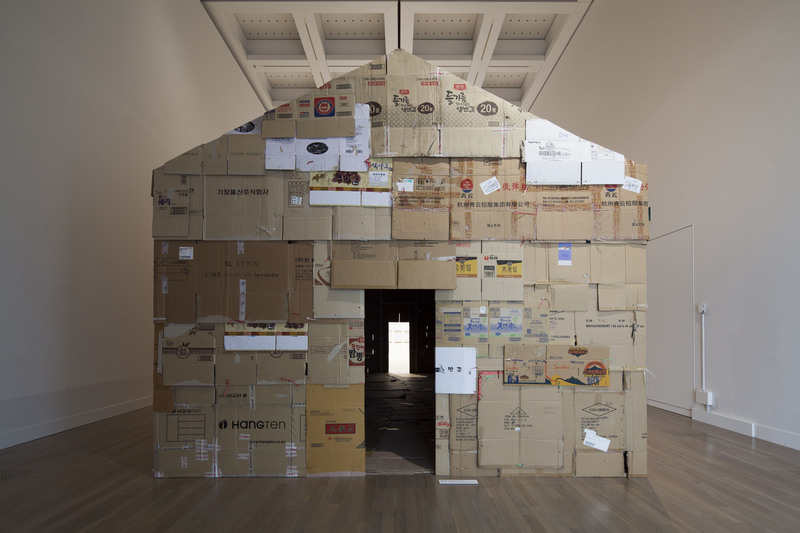 Lee’s work, by contrast, is a house made of cardboard purchased from Korean and Japanese people living on the street. A grid of framed receipts with red hanko (personal name stamps) record the transactions and are arranged in pathetic formality on the wall behind the life-size structure. Lee’s certification recognizing a group of people from whom the care of mainstream society has turned away also appears in Heungsoon Im’s installation, which has birth certificates of Koreans born during the Japanese occupation displayed behind an altar-like wooden chest laden with offerings of fruit that will decay and rot as the show goes on. 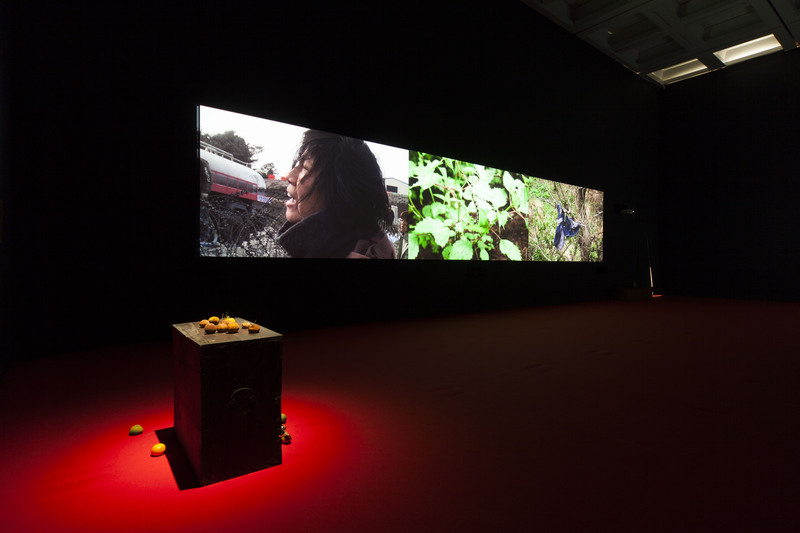 The documentary film “Jeju Prayer,” which commemorates the 1948 uprising and massacre of leftist rebels on Jeju Island, and a shorter video piece “Next Life” play to one side of the black and blood-red room. Despite being the only artist in this exhibition born before 1970, Im has just won the Silver Lion at the Venice Biennale Film Festival for promising young artist. It might be contrary to the spirit of “Artists File,” however, to let this information skew your viewing of the work. The benefit of a public art venue such as The National Art Center, Tokyo, which doesn’t have its own collection, is that it cannot promote its own canon, and this show provides a good balance between challenging visitors to make up their own minds about new work and presenting a range of contrasting practices. The hook of putting Korean and Japanese artists together is of no particular consequence, except perhaps to surreptitiously make the point that artists are a diaspora in and of themselves.